For known only to a few, the leaders of the great Hives, nations without fixed locations, have long conspired to keep the world stable, at the cost of just a little blood. A few secret murders, mathematically planned. So that no faction can ever dominate, and the balance holds. And yet the balance is beginning to give way. Mycroft Canner, convict, sentenced to wander the globe in service to all, knows more about this conspiracy than he can ever admit. Carlyle Foster, counselor, sensayer, has secrets as well, and they burden Carlyle beyond description. And both Mycroft and Carlyle are privy to the greatest secret of all: Bridger, the child who can bring inanimate objects to life. 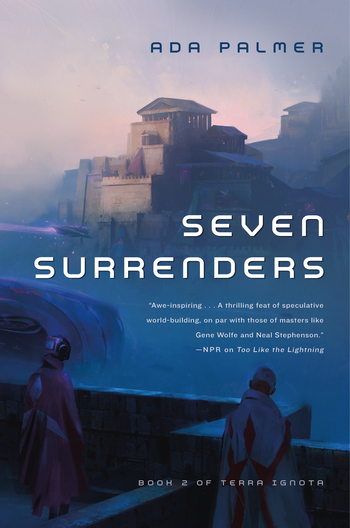 Shot through with astonishing invention, Ada Palmer's Seven Surrenders is the next movement in one of the great science fiction epics of our time. ADA PALMER is the author of the Terra Ignota series, including The Will to Battle. She is a professor in the history department of the University of Chicago, specializing in Renaissance history and the history of ideas. Her first nonfiction book, Reading Lucretius in the Renaissance, was published in 2014 by Harvard University Press. She is also a composer of folk and Renaissance-tinged a cappella music, most of which she performs with the group Sassafrass. She writes about history for a popular audience at exurbe.com and about SF and fantasy-related matters at Tor.com.